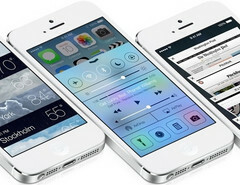 A new leak claims that the new A7 processor is 31 percent faster than the A6 powering the iPhone 5 and may also use a 64-bit architecture. In a Twitter message posted earlier today, Fox News' Clayton Morris wrote the following: "Sources are telling me the new iPhone's A7 chip is running at about 31% faster than A6. I’m hearing it’s very fast." This is a solid speed increase and Apple's flagship would benefit a lot from such an improvement, maintaining its lead in the high-end smartphone market segment. It is also rumored that Apple is already testing 64-bit processors in some iPhone 5S prototypes. Since the A7 will probably be a dual-core chip, moving from 32-bit to 64-bit is a logical move. That would enable the iPhone 5S to perform much better when handling iOS 7 graphics effects like animations or transparencies. The fifth generation iPad is expected to use the same A7 chip or a more advanced one. According to analyst Ming-Chi Kuo, the A7 may not be a 64-bit chip. In this case, Apple's first 64-bit mobile chip will be the A8, expected in 2014. The A8 processor could even be a quad-core chip. The iPhone 5S and the cheaper model known as iPhone 5C are expected to be unveiled during a press event on September 10.